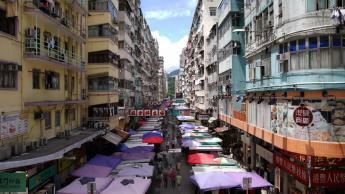 Sham Shui Po was the hub of raw materials but long-standing businesses have moved in tandem since the relocation of Hong Kong factories northward, especially on Tai Nan Street where many shops have been left vacant in recent years. However, there are shops emerging now. On the same street, there are two art and creative complexes with disparate features and a pop-up community shop which are only separated by a few shops. Through planning, a shop, a street, and a community connect brand new ideas and thoughts imperceptibly. As a small and mountainous city where the concrete jungle and the verdant countryside coexist, Hong Kong is the home to a world-renowned unique landscape. Hiking and camping thus naturally became an activity for city dwellers during holidays. Spending a day or two in the wild provides a brief escape from urban boisterousness. For them, a breath of the nature and the return to the basics of life are antidotes to the stressful working life. While camping gear tended to give an impression of being simple and pragmatic in the past, people have been increasingly demanding on camping supplies in recent years, giving rise to the popularity of gear with sophisticated design from countries such as the United States and Japan. The forms of camping also have grown to be more varied. Each form, be it leisure-oriented or ultra-light, has their own supporters. As the camping population has flourished gradually, products available in the market may not be able to fulfill such a variety of needs, and some camping enthusiasts decided to get their hands on designing and making all kinds of camping gear themselves, hence the creation of independent outdoor gear brands. Camping fanatics LEUNG Ka-po (Po), Tara CHAN, and Royce YU all have their own full-time jobs, but share the devotion of designing different camping gear in their leisure time. Once a patient of mood disorder, Po feels that the sound of burning logs possesses a healing power. Having discovered white charcoal’s characteristic of being able to endure long heating without giving out fumes, he began to design and produce by hand cookware tailor-made for cooking with wood fire and charcoal. Graphic and multi-media designer Tara loves running in mountains and builds temporary homes in the countryside. He made room for a small studio in his home where he designs extra-light backpacks and bags, blending work and pleasure in one. His most recent project is designing camping shelters with brands from Mainland China. Product designer Royce is familiar with the process of manufacturing electronic products. 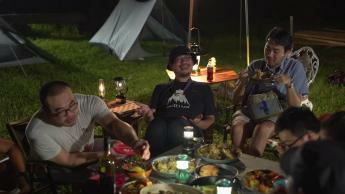 He succeeded the first time raising money through crowd-funding for a multi-use camping lamp. He hopes to showcase the versatility of Hong Kongers to the world by combining the design of vintage gas lamps and LED lights. Usually, the landscape of a place is what comes up to mind at the mention of a city. Land planners who employ conventional British colonial designs normally would divide a piece of land into two halves and put up buildings closely on both sides of the main street, by which gaps among buildings form narrow and long back alleys. These back alleys persist these days, not only are they the gathering spots for marginalised communities, but the narrow land parcel also preserve a social feature for city’s side streets. In this episode, we will focus on the discussion of architecture and urban space, through which we will also analyse city scenes such as city hall, stairs, and back alleys, and inquire into how they showcase the folk wisdom in design. “Super Normal” Design – “Super Normal” Design is a special term. It is the design concept put forward by product designers Jasper MORRISON and Naoto FUKASAWA in 2006, collectively known as produced by no name designers. “Super Normal” Products have all along been considered as both practical and simple, and everyday products which could easily be ignored by people. In this episode, Hong Kong designers Michael and Rony will pick the everyday products that suit the “Super Normal” Design in their minds; Scottish product designer Nicol often find design inspirations in Hong Kong’s “Super Normal” Products; Local craftsman LUI Ming has been trying to improve the Chinese traditional steamers in several decades, so that this local “Super Normal” Product can better meet the needs of its users; environmentalists Ah Chung and Haze designed stainless steel drinking straws to replace the plastic ones. As long as they are well-designed, all everyday products can unknowingly integrate into our lives and become “Super Normal” Designs. Each and every one of us can participate in design. We can all come up with designs that are most suitable for ourselves and our community with professional designers, according to what we and our living environment need. Social Design becomes popular in Hong Kong in recent years, and it emphasizes on the designers’ visions be switched to thinking about community, co-operation and participation. With their own professional skills, designers can resolve social problems with the general public, volunteer groups and government organizations through their designs. As SIU King-chung, Assistant Professor at the School of Design of The Hong Kong Polytechnic University, said, social design is a design “involving your participation”, and the method of social design can also change the government’s mode of governance. In this episode, through 3 social design projects, namely “Pai Tong (fixed hawker pitches) Innovation”, “Useless Frame” and “Sense – Hearing”, we will understand how the designers in Hong Kong, together with the parties concerned, volunteer groups and government organizations, try to help hawkers do better business, assist subdivided flat tenants to improve living space, and facilitate visually impaired people to appreciate exhibits in art galleries. Clothes are wearable designs which mirror one’s preferences and lifestyle. Not only are clothes of fine quality comfortable to wear, but they also underscore the merits and characters of the wearers. How much thought have the designers and fabricators given to this? Knitwear used to be everyday apparel for people from all sectors. Although the design of knitwear seems humdrum, its manufacturing process consists of many meticulous procedures. Mr. NG Chi-ming, who has manufactured knitwear for almost 60 years, will lay bare the little secret behind the undying popularity of knitwear. Polly HO, a designer, is enchanted by gambiered silk, a traditional fabric from Guangdong. The dyeing of this fabric is natural and environmentally friendly that teems with folk wisdom. She combines the gambiered silk with the printed clothes she designed to make clothing abounds with modern and narrative colours. How do elements of antiquity and novelty integrate beautifully and pass on? Does threadbare clothing represent the lower class? Rex KO, a designer who loves antique apparel, examines the world history through clothing and reflects on the definition of equality. He and Mr FAT, a leather designer, enhance classic clothing designs and design modern apparel for motorcyclists. Will they be able to place together aesthetics and practicality at the same time? Although suits are work clothes for many office workers, it does not mean they have to be monotonous. Brandice and Luke specialise in tailor-making suits which engages both their craftsmanship and creativity for customers. How do they step out of the box and produce clothing that expresses individuality, yet is wearable all the time? Words abound in nearly every part of life like air. Their existence may seem so natural that we often overlook designers’ ingenuity hidden in every single typeface. Ever since studying in a design institute, Adoninan CHAN has always been contemplating and investigating what it means by Hong Kong’s unique visual culture, as well as the elements that contribute to the city’s unparalleled urban landscape. 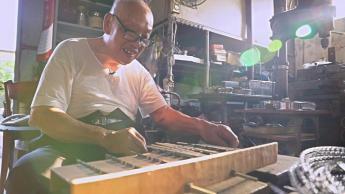 He regards the typefaces adopted in signboards on the street an outstanding feature of the city. 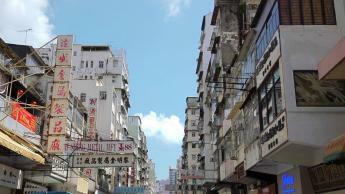 In particular, writing signboards in the Bei Wei style is almost exclusively found here in Hong Kong. With Bei Wei style gradually replaced by other styles in signboards in recent years, Adonian wishes to add a modern twist to Bei Wei style through typeface design, hence preservation of this typeface that is quintessentially Hong Kong. Julius HUI is a professional typeface designer. In addition to design, he is also passionate about looking into the development and history of typefaces. When reading ancient Chinese texts, he discerned that the design of typefaces actually is crucial in helping readers read comfortably and remain focused. This has inspired him to design a Chinese typeface that is more vibrant and energetic, hoping to render reading more appealing and hassle-free. During over three decades of working in Chinese typeface design, Sammy OR’s works include classic designs such as MTRSong in MTR stations and Li Song in newspapers. For the past eight years, Sammy has been entirely devoted to a new Gothic typeface that he hopes will be a breakthrough in terms of artistry and clarity. Home, a place utilised by everyone every day. Is there any space for creativity in home design apart from satisfying customers’ requests for functionality and aesthetics? How should home designers create a home of originality? In this episode, we will probe into lamps, wooden furniture, fragrant design and multifunctional furniture. Through the sharing and production of designers from different sectors, we will analyse the philosophy behind home design, the relationship between design and the real life, as well as the wisdom embedded therein. 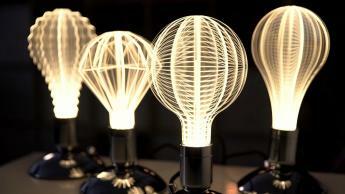 LAW Yat-ming is a lamp designer who loves to employ delightful things as his design elements. By using light and shadow along with his easy-to-use works, he shares with the users the concepts of his designs. 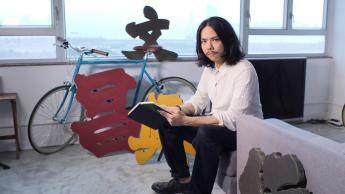 Thomas WONG is one of the few furniture designers in Hong Kong. He insists on making furniture with solid wood using traditional carpentry techniques despite how time-consuming it is, in the hope of making his works more durable. Xavier TSANG, a fragrant designer, savours and captures the intangible odour with his heart and blend fitting fragrances for home. He even makes this smell of home portable, enabling it to stay in company with us all the time. Vincent LIM and Elaine LU are conjugal partners in furniture design. Although the couple’s preferences on design are poled apart, they have sought common ground through their shared language, design, which gives rise to flexible multifunctional furniture.